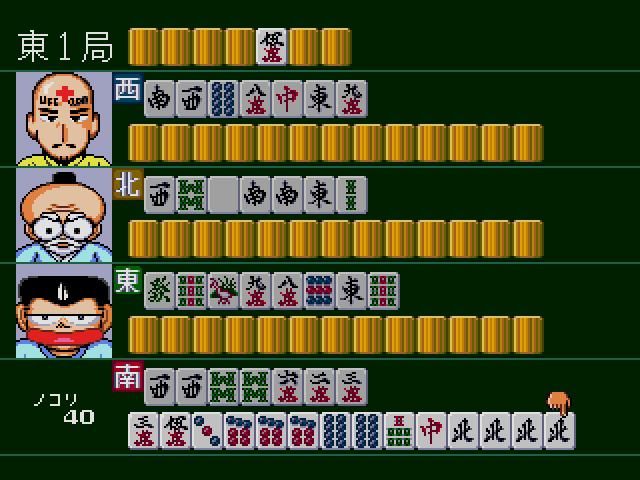 By far one of the longest titles I’ve seen for a game thus far on Sega Does, Gambler Jiko Chuushinha: Katayama Masayuki Mahjong Doujou is, for all its longwindedness, a mahjong game. 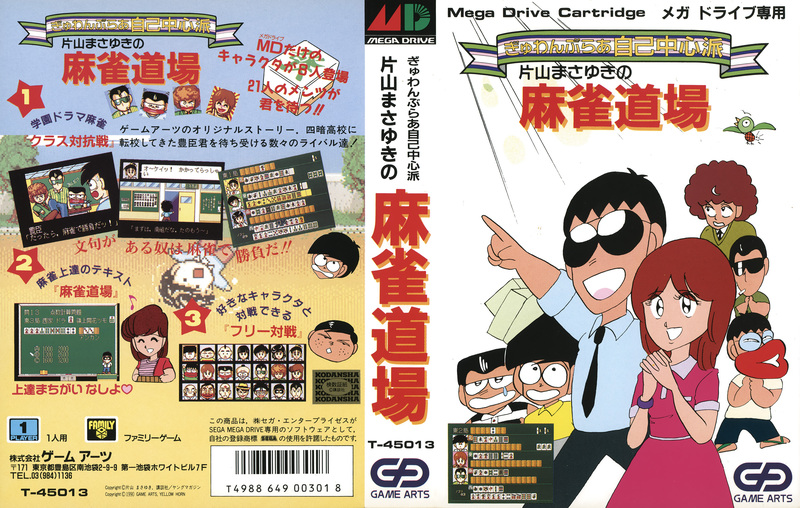 Based on the manga, “Gambler Jiko Chuushinha” by Masayuki Katayama, the title effectively translates to “Self-Centered Gambler School: Masayuki Katayama’s Mahjong Dojo.” I shouldn’t have to say this about any mahjong game, but I will anyway: this game never came to America and no one has dared make a translation. At least it’s only mahjong, right? Shouldn’t be too hard to understand. 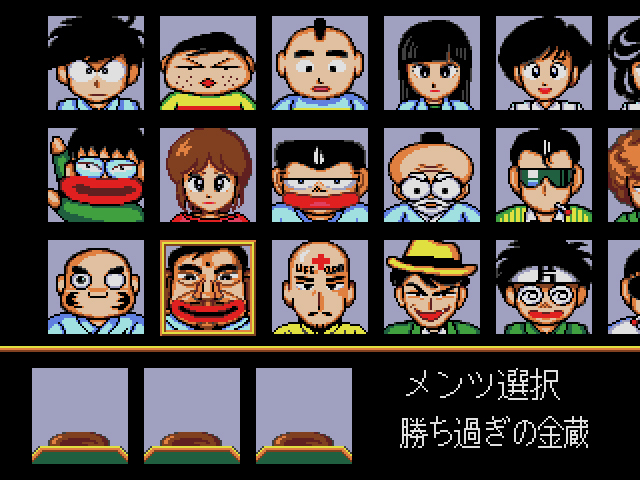 A game with the subtitle “Mahjong Dojo” is clearly excited about mahjong and wants you to be as well. 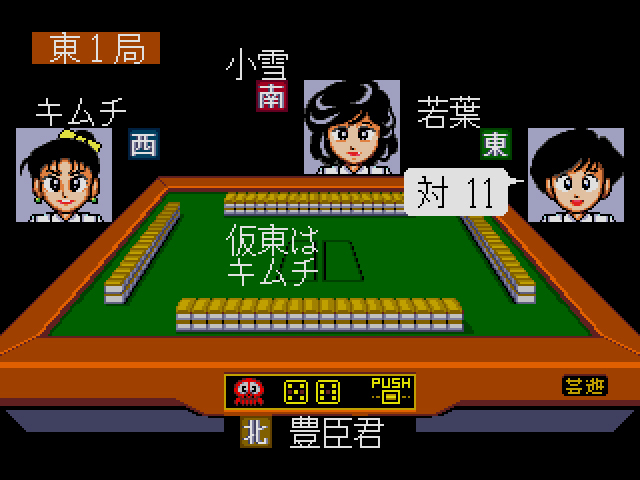 You have three options: a basic game of 4-player mahjong with random characters from the manga; a story mode where characters “resolve their differences” through mahjong (https://tcrf.net/Gambler_Jiko_Chuushinha:_Katayama_Masayuki_no_Mahjong_Doujou); or a mahjong quiz rumble in Katayama’s Dojo. The cast of characters, all of whom you should take very seriously. I was expecting a lot of mahjong here, and I was not disappointed. Good glory, is there a lot of mahjong. I’ve played many a mahjong title already, and this might be the mahjong-iest. For those who love table tile antics, this is a great thing. I’m a pretty lousy mahjong player, but I respect both the game’s rich history and the skill it takes to play well. If you like mahjong, Gambler Jiko… is an all-you-can-eat buffet. 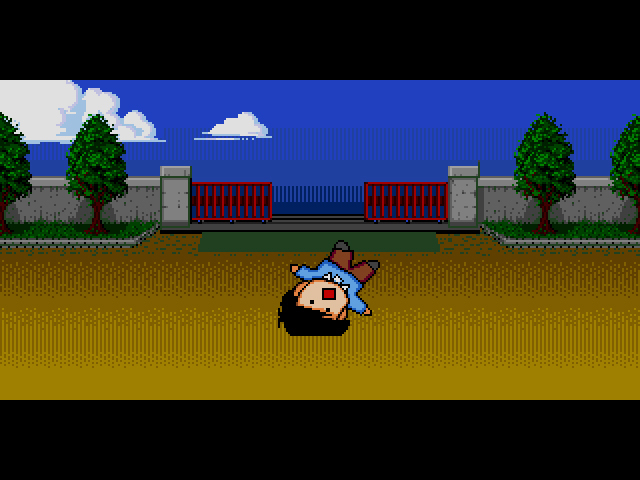 Me, after several mahjong games in a row. What I wasn’t expecting from Gambler Jiko… was the sheer amount of kanji presented at rapid-fire speed. Most Japan-only games I’ve encountered to this point usually have text in hiragana and katakana, with only a smattering of kanji. With my basic Japanese comprehension skills, if I need to, I can set aside some time and make heads or tails of what’s going on. Not here. Gambler Jiko… is for the skilled Japanese reader only. Basically, I couldn’t follow the story mode. Or understand most of the options presented. Not even a little bit. The cutscenes are long and drawn-out – makes sense given the game’s manga roots – and, based on the illustrations, look pretty amusing. I would love to know why the characters are getting mad enough to have mahjong smackdowns, but alas. When a mahjong bout appeared, I could finally play, but again, not very well. 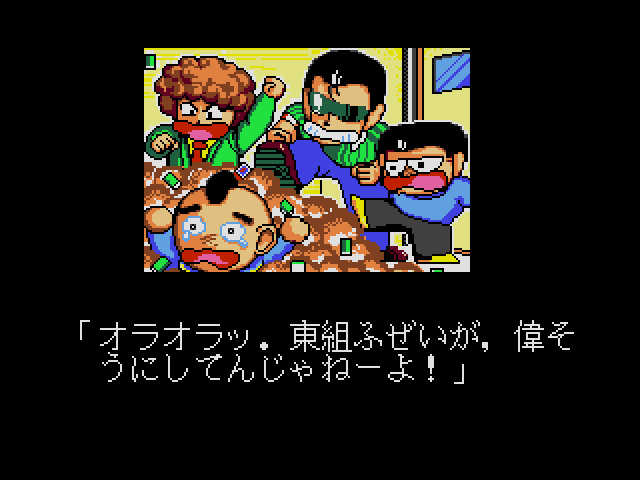 After the punching and screaming dies down, a civil mahjong match emerges. Gambler Jiko… was not developed in a vacuum. This is a series that spans several systems, including the Famicom, Super Famicom, Sega CD, MSX, and possibly more. To make matters weirder, some of these titles were developed by Game Arts, also known as the development company behind the beloved Lunar and Grandia RPGs. Whatever it takes to pay the bills. The winning tile, I’m sure of it. The character designs are hilarious. The concept of a Self-Centered Gambling School is great. 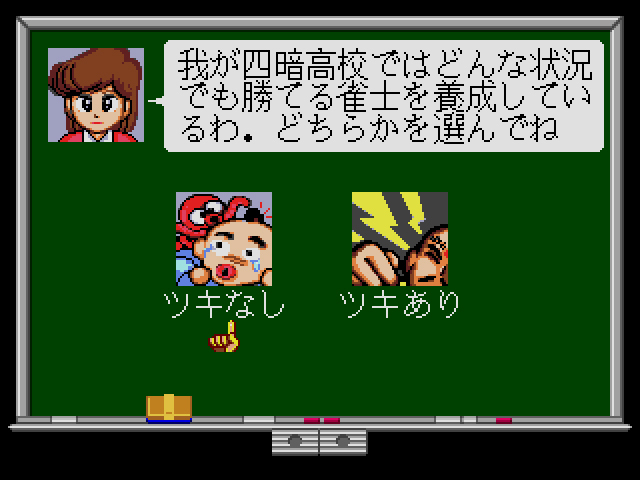 The fact that creator Masayuki Katayama got to attach his name to a Mahjong Dojo via a Mega Drive game… that’s pretty cool too. If you have advanced Japanese reading skills and you love a good game of mahjong, I’m willing to bet you’ll get some leverage out of Gambler Jiko. For the rest of us (or just me because, let’s be honest, nobody else is playing this game right now), it’s another forgotten oddity, destined for the bargain bins of Super Potatoes everywhere. I like the M rating. I might actually be interested in trying Mahjong if someone would actually translate one of these. There has to be at least one translated mahjong game, right? I think these Japanese Mahjong games should have their own rating system based around M’s. Seriously though, good write up. Have a lot of respect for you for trying all these Mahjong games and trying to give them a fair, detailed review! You can never be sure, even with decades-old, Japanese-exclusive mahjong titles. The Twitch streamer Goati just beat Tel-Tel Mahjong…after 234 hours of gameplay!